Frank Douglass moved to Citra in 1918 to grow citrus and raise cattle, moving from the family homestead in Lake County, FL to farm on his own. He raised his family there as the orange juice industry in Florida began to flourish due to increase in consumption during and after World War II. His son Edward Lamar “Buddy” Douglass helped his father run the citrus and cattle operation, until his son, Terry Douglass was ready to take over part-time, until the freezes took the citrus industry in North Central Florida in the early 1980’s. He began an ornamental tree operation on the farm in the early 1990’s for the landscaping industry. Upon high school graduation, a fourth generation son, Tavis Douglass, attended the University of Florida, where he earned his Bachelor’s degree in Agricultural Operations Management and subsequent Master’s in Agribusiness. Graduating in 2008, he began working as a nursery manager at a larger blueberry farm, honing his skills in the fruit and vegetable industry. In 2012, he became an adjunct instructor of upper division agricultural courses for Bachelor’s students in Agribusiness at the local college. It is here where he began to develop his passion for teaching people about the story and importance of agriculture. He still operates a blueberry nursery at a local commercial blueberry farm full-time and works at the Douglass family farm on weekday afternoons and weekends. His sister, Katie Douglass also raised on the farm, is currently a University of Florida student in Animal Sciences and continues to manage the cattle operations of our farm. In the aftermath of the global financial crisis in the late 2000’s, the Douglass’s decided to make a change in their operations. They began using the skills and knowledge developed from devoting their lives to agriculture by beginning to grow many different types of edible crops including many seasonal vegetables and hydroponic systems. 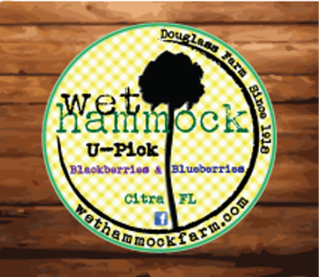 In 2013 we decided to establish a U-Pick farm growing several types of fruit crops. Currently planted are blackberries, blueberries as well as peaches. All members of the Douglass Family are active in all phases of the farm. We hope to increase consumer appreciation of small farmers, help people realize the importance of local food security and the health benefits of eating fresh, whole, unprocessed foods.